John Coltrane, one of the most influential players of the 20th Century, here photographed at the famous Village Gate in Greenwich Village, on a hot August evening, 1961. He was performing with Eric Dolphy, and each tragically died much too young. 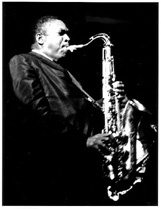 Coltrane was devoted to his music, could practice 20 hours straight and in the process he became one of the jazz leaders before he died in 1967. He was proficient on the tenor as well as the soprano saxophone and many other saxophone players began to play soprano because of him.